There is little that is more important to a worker than his or her wages. And as has been discussed in an earlier post on this blog, real wages in the US have stagnated since around 1980. An important question is whether this has changed recently. Trump has claimed that his policies (of lifting regulations, slashing corporate taxes, and imposing high tariffs on our trading partners) are already leading to higher wages for American workers. Has that been the case? The answer is no. As the chart at the top of this post shows, real wages have been close to flat. Nominal wages have grown with inflation, but once inflation is taken into account, real wages have barely moved. And one does not see any sharp change in that trend after Trump took office in January 2017. It is of course still early in Trump’s term, and the experience so far does not mean real wages will not soon rise. We will have to see. 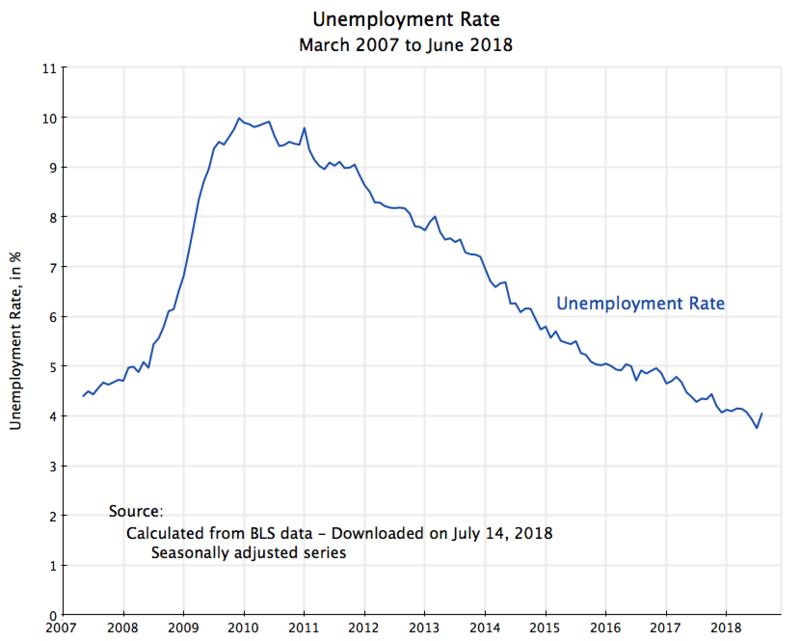 One should indeed expect that they would, as the unemployment rate is now low (continuing the path it has followed since 2010, first under Obama and now, at a similar pace, under Trump). But the primary purpose of this blog post is to look at the numbers on what the experience has been in recent years, including since Trump took office. We will see that the trend has not much changed. And to the extent that it has changed, it has been for the worse. We will first take an overall perspective, using the chart at the top of this post and covering the period since 2006. This will tell us what the overall changes have been over the full twelve years. For real wages, the answer (as noted above) is that not much has changed. But the overall perspective can mask what the year to year changes have been. So we will then examine what these have been, using 12 month moving averages for the changes in nominal wages, the consumer price index, and then the real wage. 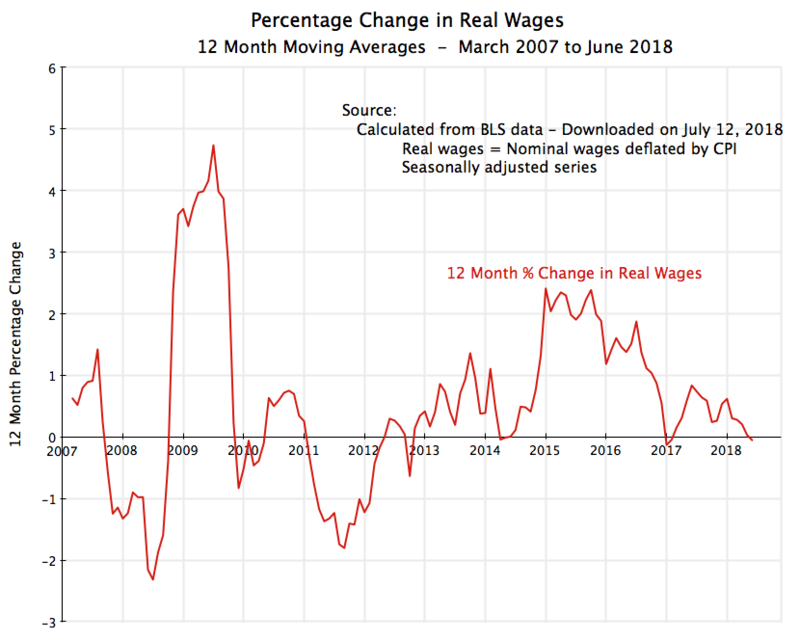 And we will see that changes in the real wage have actually been trending down of late, and indeed that the average real wage in June 2018 was below where it had been in June 2017. We will then conclude with a short discussion of whether labor market trends have changed since Trump took office. They haven’t. But those trends, in place since 2010 as the economy emerged from the 2008/09 downturn, have been positive. At some point we should expect that, if sustained, they will lead to rising real wages. But we just have not seen that yet. It is useful first to start with an overall perspective, before moving to an examination of the year to year changes. 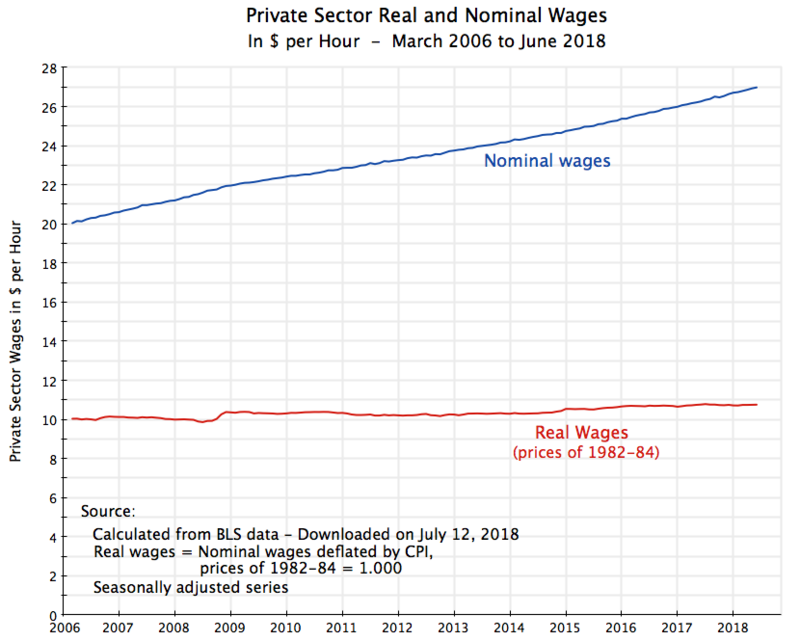 The chart at the top of this post shows average nominal wages in the private sector, in dollars per hour, since March 2006, and the equivalent in real terms, as deflated by the consumer price index (CPI). The current CPI takes the prices of 1982-84 (averaged over that period) as the base, and hence the real wages shown are in terms of the prices of 1982-84. For June 2018, for example, average private sector wages were $26.98 per hour, equivalent to $10.76 per hour in terms of the prices of 1982-84. The data series comes from the Current Employment Survey of the Bureau of Labor Statistics, which comes out each month and is the source of the closely watched figures on the net number of jobs created each month. The report also provides figures on average private sector wages on a monthly basis, but this particular series only started being reported in March 2006. That is part of the reason why I started the chart with that date, but it is in any case a reasonable starting point for this analysis as it provides figures starting a couple of years before the economic collapse of 2008, in the last year of Bush’s presidential term, through to June 2018. The BLS report also only provides figures on average wages in the private sector. While it would be of interest also to see the similar figures on government wages, they are not provided for some reason. If they had been included, the overall average wage would likely have increased at an even slower pace than that shown for the private sector only, as government wages have been increasing at a slower pace than private wages over this period. But government employment is only 15% of total employment in the US. Private wages are still of interest, and will provide an indication of what the market pressures have (or have not) been. The chart shows that nominal wages have increased at a remarkably steady pace over this period. Many may find that lack of fluctuation surprising. The economy in 2008 and early 2009 went through the sharpest economic downturn since the Great Depression, and unemployment eventually hit 10.0% (in October 2009). Yet nominal private sector wages continued to rise. 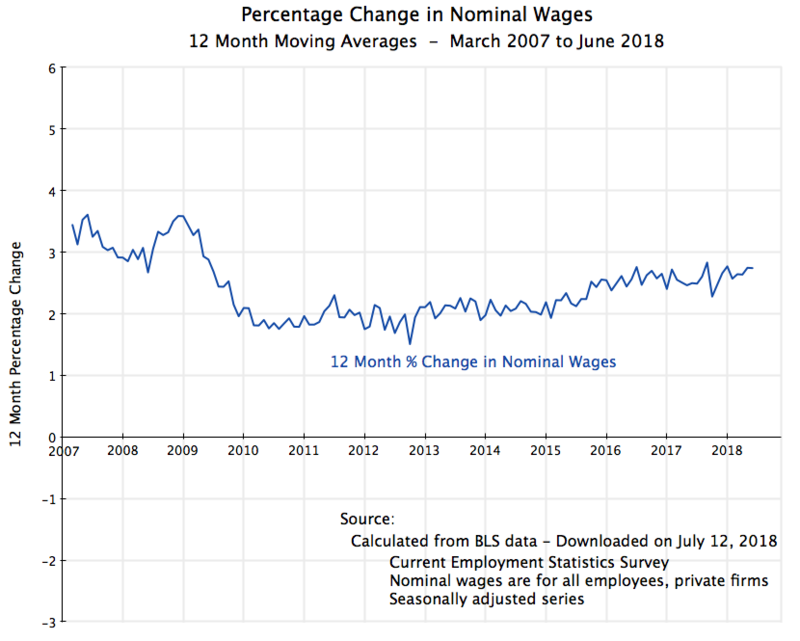 As we will discuss in more detail below, nominal wages were increasing at about a 3% annual pace through 2008, and then continued to increase (but at about a 2% pace) even after unemployment jumped. But while nominal wages rose at this steady pace, it was almost all just inflation. After adjusting for inflation, average real wages were close to flat for the period as a whole. They were not completely flat: Average real wages over the period (March 2006 to June 2018) rose at an annual rate of 0.57% per year. This is not much. It is in fact remarkably similar to the 0.61% growth in the average real wage between 1979 and 2013 in the data that were discussed in my blog post from early 2015 that looked at the factors underlying the stagnation in real wages in the decades since 1980. But as was discussed in that blog post, the average real wage is not the same as the median real wage. The average wage is the average across all wage levels, including the wages of the relatively well off. The median, in contrast, is the wage at the point where 50% of the workers earn less and 50% earn more. Due to the sharp deterioration in the distribution of income since around 1980 (as discussed in that post), the median real wage rose by less than the average real wage, as the average was pulled up by the more rapid increase in wages of those who are relatively well off. And indeed, the median real wage rose by almost nothing over that period (just 0.009% per year between 1979 and 2013) when the average real wage rose at the 0.61% per year pace. If that same relationship has continued, there would have been no increase at all in the median real wage in the period since 2006. But the median wage estimates only come out with a lag (they are estimated through a different set of surveys at the Census Bureau), are only worked out on an annual basis, and we do not yet have such estimates for 2018. While the chart at the top of this post tracks the cumulative changes in wages over this period, one can get a better understanding of the underlying dynamics by looking at how the changes track over time. For this we will focus on percentage changes over 12 month periods, worked out month by month on a moving average basis. Or another way of putting it, these will be the percentage changes in the wages or the CPI over what it had been one year earlier, worked out month by month in overlapping periods. Note that the date labels are for the end of each period. Thus the point labeled at the start of 2008 will cover the percentage change in the nominal wage between January 2007 and January 2008. And the starting date label for the chart will be March 2007, which covers the period from March 2006 (when the data series begins) to March 2007. Prior to the 2008/09 downturn, nominal wages were growing at roughly 3% a year. Once the downturn struck they continued to increase, but at a slower pace of roughly 2% a year or a bit below. And this rate then started slowly to rise over time, reaching 2.7% in the most recent twelve-month period ending in June 2017. The changes are remarkably minor, as was also noted above, and cover a period where unemployment was as high as 10% and is now just 4%. There has been very little year to year volatility. But note that “larger” should be interpreted in a relative sense. The absolute changes were generally not all that large (with some exceptions), and can mostly be attributed to changes in the prices of a limited number of volatile commodities, namely for food items and energy (oil). The prices of such commodities go up and down, but over time they even out. Thus for understanding inflationary trends, analysts will often focus instead on the so-called “core CPI”, which excludes food and energy prices. For the full period being examined here, the regular CPI rose at a 1.88% annual pace while the core CPI rose at a 1.90% pace. Within round-off, these are essentially the same. With the relatively steady changes in average nominal wages, year to year, the fluctuations will basically be the mirror image of what has been happening to inflation. When prices fell, real wages rose, and when prices rose more than normal, real wages fell. Prices are now again rising, although still within the norm of the last twelve years. 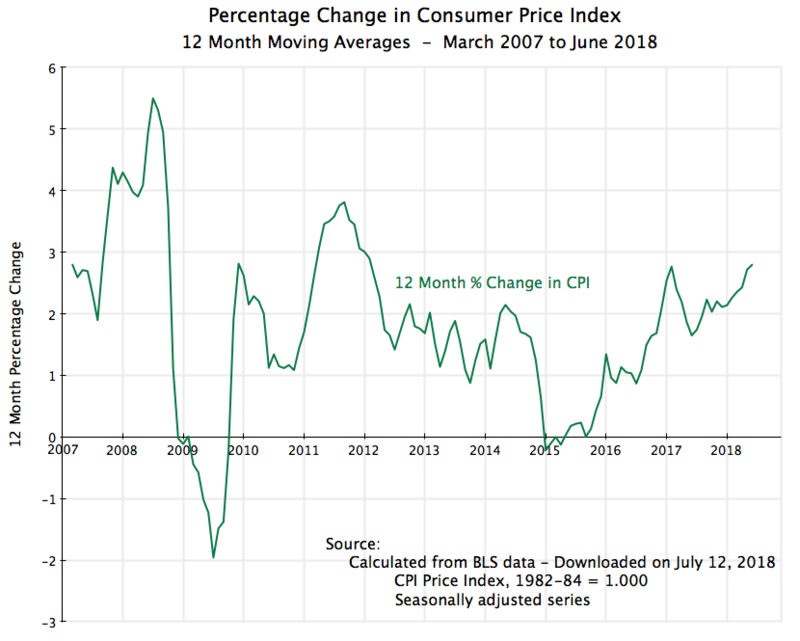 For the 12 months ending in June 2018, the CPI (using the seasonally adjusted series) rose at a 2.8% rate. The average nominal wage rate rose at a rate of 2.74% and thus the real wage fell slightly by 0.05% (calculated before rounding). Average real wages are basically the same as (and formally slightly below) where they were a year ago. There is thus no evidence that the measures Trump has trumpeted (of deregulation, slashing taxes for corporations, and launching a trade war) have led to a step up in real wages. This should not be surprising. Deregulation which spurs industry consolidation increases the power of firms to raise prices while holding down wages. And there is no reason to believe that tax cuts will lead quickly to higher wages. Corporations do not pay their workers out of generosity or out of some sense of charity. In a market economy they pay their employees what they need to in order to get the workers in the number and quality they need. And although there can be winners in a trade war, there will also certainly be losers, and overall there will be a loss. Workers, on average, will lose. But what is surprising is that wages are not now rising by more in an economy that has reached full employment. Federal Reserve Chair Jerome Powell, for example, has called this “a puzzle”. And indeed it is. Again, the pace since Trump took office is similar to (but a bit slower than) the pace when Obama was still in office. But the somewhat slower pace should not be surprising. With the economy at close to full employment, one should expect the pace to slow. Indeed, the unemployment rate cannot go much lower. There is always a certain amount of “churn” in the job market, which means an unemployment rate of zero is impossible. And many economists in fact have taken a somewhat higher rate of unemployment (or at least 5.0%) as the appropriate target for “full employment”, arguing that anything lower will lead to a wage and price spiral. But we have not seen any sign of that so far. Nominal wages are rising at only a modest pace, and indeed over the last year at a pace less than inflation. There has been no step up in real wages since Trump took office. Indeed, over the past twelve months, they fell slightly. But while there is no reason to believe there should have been a jump in real wages following from Trump’s economic policies (of deregulation, tax cuts for corporations, and trade war), it is surprising that the economy is not now well past the point where low unemployment should have been spurring more substantial wage gains. This very well could change, and indeed I would expect it to. There is good reason to believe that the news for the real wage will be a good deal more positive over the next year than it has been over the past year. But we will have to wait and see. So far it has not happened. The previous post on this blog looked at what a true tax reform could look like, addressing issues pertaining to corporate and individual income taxes. This post will look at what should be done for Social Security and the taxes that support it. Our federal tax system involves more than just income taxes. Social Security taxes are important, and indeed many individuals pay more in Social Security taxes than they do in individual income taxes. Overall, Social Security taxes account for just over a quarter of total federal revenues collected in FY2017, and are especially important for the poor and middle classes. With a total tax of 12.4% for Social Security (formally half paid by the employee and half by the employer, but in reality all ultimately paid by the employee), someone in the 10% income tax bracket is in fact paying tax at a 22.4% rate on their wages, someone in a 15% bracket is actually paying 27.4%, and so on up to the ceiling on wages subject to this tax of $128,400 in 2018. They also pay a further 2.9% tax on wages for Medicare (with no ceiling), but this post will focus just on the Social Security side. And as is well known, the Social Security Trust Fund is forecast to be depleted by around 2034 if Congress does nothing. Social Security benefits would then be automatically scaled back by about 22%, to a level where the then current flows going into the Trust Fund would match the (cut-back) outflows. This would be a disaster for many. Congress needs to act. A comprehensive tax reform thus should include measures to ensure the Social Security Trust Fund remains solvent, and is at a minimum able, for the foreseeable future, to continue to pay its obligations in full. Also, and as will be discussed below, Social Security benefit payments are embarrassingly small. Cutting them further is not a “solution”. And despite their small size, many now depend on Social Security in their old age, especially as a consequence of the end of most private company defined benefit pension schemes in recent decades. We really need to look at what can be done to strengthen and indeed expand the Social Security safety net. The final section below will discuss a way to do that. As was discussed in an earlier post on this blog, the Social Security Trust Fund is forecast to run out by around 2034 not because, as many presume, baby boomers will now be retiring, nor because life expectancies are turning out to be longer. Both of these factors were taken into account in 1983, when following recommendations made by a commission chaired by Alan Greenspan, Social Security tax rates were adjusted and other measures taken to ensure the Trust Fund would remain solvent for the foreseeable future. Those changes were made in full awareness of when the baby boomers would be retiring – they had already been born. And while life expectancy has been lengthening, what matters is not whether life expectancy has been growing longer or not, but rather whether it has been growing to be longer than what had earlier been forecast when the changes were made in 1983. And it hasn’t: Life expectancy has turned out to be growing more slowly than earlier forecast, and for some groups has actually been declining. In itself, this would have lengthened the life of the Social Security Trust Fund over what had been forecast. But instead it was shortened. Why is it, then, that the Trust Fund is now forecast to run out by around 2034 and not much later? As discussed in that earlier post, the Greenspan Commission assumed that wage income inequality would not change going forward. At the time (1983) this was a reasonable assumption to make, as income inequality had not changed much in the post World War II decades leading up to the 1980s. But from around 1980, income distribution worsened markedly following the Reagan presidency. This matters. Wages above a ceiling (adjusted annually according to changes in average nominal wages) are exempted from Social Security taxes. But with the distribution of wages becoming increasingly skewed (in favor of the rich) since 1980, adjusting the ceiling according to changes in average wages will lead to an increasing share of wages being exempted from tax. An increasing share of wage income has been pulled into the earnings of those at the very top of the income distribution, so an increasing share of wages has become exempt from Social Security taxes. As a direct consequence, the Social Security Trust Fund did not receive the inflows that had been forecast. Thus it is now forecast to run out by 2034. Unfortunately, we cannot now go back in time to fix the rates and what they covered to reflect the consequences of the increase in inequality. Thus what needs to be done now has to be stronger than what would have been necessary then. Given where we are now, one needs to remove the ceiling on wages subject to the Social Security tax altogether to ensure system solvency. If that were done, the depletion of the Social Security Trust Fund (with all else unchanged, including the benefit formulae) would be postponed to about 2090. Given the uncertainties over such a time span (more than 70 years from now), one can say this is for the foreseeable future. The chart at the top of this post (taken from the earlier blog post on this issue) shows the paths that the Social Security Trust Fund to GDP ratio would take. If nothing is done, the Trust Fund would be depleted by around 2034 and then turn negative (not allowed under current law) if all benefits were continued to be paid (the falling curve in black). But if the ceiling on wages subject to tax were removed, the Trust Fund would remain positive (the upper curves in blue, where the one in light blue incorporates the impact of the resulting benefit changes under the current formulae, as benefits are tied to contributions). As discussed in that earlier blog post, the calculations indicate the Social Security Trust Fund then would remain solvent to a forecast year of about 2090. That is over 70 years from now, and the depletion at that time is largely driven by the assumption (by the Social Security demographers) on how fast life expectancy is forecast to rise in the future. This could again be over-estimated. Lifting the ceiling on wages subject to Social Security tax would also be equitable: The poor and middle classes are subject to the 12.4% Social Security tax on all of their wages; a rich person should be similarly liable for the tax on all of his or her earnings. And I cannot see the basis for any argument that a rich person making a million dollars a year cannot afford the tax, while a poor person can. But I would go further. In the modern era, there is no reason why the Social Security tax should be applied solely to wage earnings, while earnings from wealth are not taxed at all. As one of the basic principles of taxation noted in the previous post on tax reform, all forms of income should be taxed similarly, and not with differing rates applied to one form (e.g. 12.4% on wages) as compared to another (e.g. 0% on income from wealth). Broadening the base would allow, if nothing else is changed, for a reduction in the rate to produce the same in revenues. We can calculate roughly what that lower rate would be. Making use of IRS data for incomes reported on the Form 1040s in 2015 (the most recent year available), one can calculate that if Adjusted Gross Income (line 37 of Form 1040) was used as the base for the Social Security tax rather than just wages, the Social Security tax rate could be cut from 12.4% to 8.6% to generate the same in revenues. That is, taxing all reported income (including income from wealth) at an 8.6% rate (instead of taxing just wages at 12.4%) would generate sufficient revenues for the Social Security Trust Fund to remain solvent for the foreseeable future. This would be a more than 30% fall in the taxes on wages, but also, of course, a shift to those who also earn a substantial share of their income from wealth. The 8.6% tax on all forms of income would generate the revenues needed to keep the Social Security Trust Fund solvent at the benefit levels as defined under current law. But Social Security benefit payments are embarrassingly small. Using figures for September 2017 from the Social Security Administration, the average benefit paid (in annualized terms) for all beneficiaries is just $15,109, for retired workers it is $16,469, and for those on disability it is $12,456. These are not far above (and for disability indeed a bit below) the federal poverty guideline level of $13,860 in 2017 for a single individual. And the average benefit levels, being averages, mean approximately half of the beneficiaries are receiving less. Yet even at such low levels, Social Security benefits account for 100% of the income of 20% of beneficiaries aged 65 or higher; for 90% or more of the incomes of 33% of those aged beneficiaries, and 50% or more of the incomes of 61% of those aged beneficiaries (data for 2014; see Table 9.A1). And for those aged 65 or older whose income is below the federal poverty line, Social Security accounts for 100% of the income of 50% of them, for 90% or more of the income of 74% of them, and for 50% or more of the income for 93% of them (see Table 9.B8). The poor are incredibly dependent on Social Security. Thus we really should be looking at a reform which would allow such benefit payments to rise. The existing levels are too low to serve as an effective safety net in a country where defined benefit pension plans have largely disappeared, and the alternative approach of IRAs and 401(k)s has failed to provide adequate pensions for many if not most workers. This would make a significant difference to those most dependent in their old age on Social Security. The poorest third of retirees receiving Social Security received (in December 2015 and then annualized) a payment of just $8,761 per year. Increasing this by 45% would raise it to $12,733. While still not much, it would be an increase of almost $4,000 annually. And for a married couple where both had worked and are now receiving Social Security, the benefits would be double this. It would make a difference. Conservatives have long been opposed to the Social Security system (indeed since its origin under Roosevelt), arguing that it is a Ponzi scheme, that it is unsustainable, and that the only thing we can do is to scale back benefits. None of this is true. Rather, Social Security has proven to be a critically important support for the incomes of the aged. An astonishingly high share of Americans depend on it, and its importance has only increased with the end of defined benefit pension schemes for most American workers. But there are, indeed, problems. Due to the ceiling on wages subject to Social Security tax, and the sharp increase in inequality starting in the 1980s under Reagan and continuing since, an increasing share of wages in the nation have become exempt from this tax. As a consequence, and if nothing is done, the Trust Fund is now forecast to run out in 2034. This would trigger a scaling back of the already low benefits by 22%. This would be a disaster for many. Lifting the ceiling on wages, so that all wages are taxed equally, would resolve the Trust Fund solvency issue for the foreseeable future (to a forecast year of about 2090). Benefits as set under the current formulae could then be maintained. Furthermore, if the base for the tax were extended to all forms of income (including income from wealth), and not limited just to wages, benefits as set under current formulae could be sustained with the tax rate cut from the current 12.4% to a new rate of just 8.6%. But as noted above, current benefits are low. One should go further. Cutting the rate to just 10%, say, would allow for a significant increase in benefits. Focussing the increase on the poorest, who are most dependant on Social Security in their old age, a rate of 10% applied to all forms of income would allow benefits to rise by 5% for the top third of retirees, by 15% for the middle third, and by a substantial 45% for the bottom third. This would make a real difference. After many months in development, although behind closed doors until near the end, Republicans in Congress approved on December 20 a sweeping change in the nation’s tax laws. Trump signed the measure on December 22, and it will go into effect in 2018. However, this is not, in fact, a tax reform. Rather, the measures are primarily a series of tax cuts for certain favored groups. The greed on display was breathtaking, as special interest lobbyists were able to get many of their provisions included, with the legislation then rammed through on largely party-line votes. The specific legislative language was kept secret to as late as possible, no public hearings with expert testimony were held, and tax lawyers are already finding numerous newly created loopholes in the drafting. Instead of simplifying the tax system, the new law has created numerous opportunities for various special interests to game the system and avoid taxes that others must pay. And it truly is a Republican tax plan, not just Trump’s. On the key votes, 100% of Republicans in the Senate voted for it, while 95% of Republicans in the House did so. No attempt was made to develop a bipartisan plan, and Democrats were never consulted on it. Thus, not surprisingly, no Democrats voted for it. For these reasons, I will refer to it below as the Republican tax plan. A true tax reform would be quite different. The reforms themselves would be revenue neutral, with the focus on measures to simplify and rationalize the tax system. Tax rates would then be adjusted up or down, as necessary, to restore the revenues that would be lost or gained by the reform measures. But the measure passed is instead forecast to produce a net loss in revenues of $1.5 trillion over the next ten years (and many believe the cost will in fact be higher as the cost from the new loopholes created, as well as from rushed, and consequently poor, drafting language, will be greater than congressional staff forecast). But even at $1.5 trillion, the loss in tax revenues is not small. But tax reform is possible, provided there is a modicum of political will, and reform is indeed certainly needed. This post will look at what a true tax reform could look like. a) Taxes due should not depend on the source of a person’s income (whether from wages or from wealth), but rather on that person’s total income from all sources. b) Tax rates should be progressive. Those with a higher income should pay taxes at a higher rate than those with a lower income. As Warren Buffett has noted, he pays taxes (perfectly legally under the current system) at a lower rate than what his far less rich secretary pays. That is not fair. c) And the system should be as simple as possible. Taxing income from all sources similarly would be a huge step to a simpler system, as much of the complexity arises from taxing different sources of income differently. But there is more that could be done beyond this to simplify the system. Indeed, one suspects that Congress has often added needless complexity to the tax code for purely political reasons. The discussion below will be on reforms to taxes on income, whether corporate or individual. Much of the focus of the recently passed tax legislation has been on the corporate income tax, which would be permanently slashed. It is a complex topic, especially due to the international aspects of it (how to treat income earned abroad by US corporations, and income generated in the US by foreign-owned corporations). It is also inextricably linked to individual income taxes, as individuals ultimately own corporations and receive the incomes corporations generate. Thus income taxes on corporations and on individuals should be considered together. The first section below thus will consider what a reform of corporate income taxes could look like, with the next section then looking at reforms to the individual income system. We will then look at rough estimates of the tax revenue implications of such reforms. Under the simplified system of taxes proposed, where all forms of income are taxed similarly, it is estimated that total tax revenues generated would rise, by close to $2.5 trillion over the next ten years. One could then adjust rates downward to yield the same tax revenues as is being generated by the fragmented system we have had up to now current. A comprehensive tax reform would cover more, however, than just income taxes. This blog post will therefore be followed by two more: One on reforms to Social Security taxes in order to ensure the Social Security trust fund remains solvent (it will run out around 2034 if Congress does nothing), and one which proposes a tax on emissions of greenhouse gases (commonly referred to as a carbon tax, as it would apply to carbon dioxide emissions primarily) in order to address climate change. Both of these reforms would be designed to be revenue neutral, in the sense that Social Security taxes would be directed to what is required to fund Social Security benefits, while the revenues collected by a tax on greenhouse gas emissions would all be rebated to American households. Thus they can be treated separately from reforms to the corporate and individual income tax systems. Note finally that in the discussion below, reforms will be discussed in terms of changes relative to the tax system that has been in place up to now. It will change as of January 1, 2018, under the recently passed Republican legislation, with many changes including new rates. But the aim here is to discuss what a true tax reform could have looked like. In addition, data we have on tax revenues (current and projected) are all in terms of the current tax system, not the new one, and we need such data to estimate what the revenue impacts would be of a true reform. Thus references to tax rates and other aspects of the tax system will all be in reference to what we have had up to now. Corporate income taxes (or corporate profit taxes – the terms will be used interchangeably) were a focus in the recent debate on taxes, with a good deal of hyperbole and confusion. It is also a complex and peculiar tax, which exists today in its current form probably more for historical reasons than as something one would create now if one were to start anew. The reason is that a corporation is purely a legally constructed entity, which defines an organizational structure that can borrow money, hire workers, produce something, sell it, and then distribute the gains from this production in accordance with decisions made in a precisely defined decision-making structure. Whatever is gained is distributed to someone, or it is retained on the books of the corporation for use in the future. But in taxing these corporate profits, including what is then distributed to individuals as their share of the profits, one is taxing the same gains twice – at the level of the company and then at the level of the individual. This is double taxation, and creates problems. The special, low, rate of tax paid on capital gains (on earnings from the sale of corporate shares, as well as from the sale of other assets) has been justified for this reason. But that low rate is then of special benefit to those who are well-off compared to others. This is not what one should want in a system of progressive taxation. There are other problems as well, starting importantly with how one defines taxable corporate profits. Profits are revenues obtained from selling a product minus the cost of producing it, but how one defines “revenues” and “costs” is not a simple matter. Revenues, for example, may be paid in cash in the current period, but might also accrue now but only be paid at some future time (as credit is extended). How should one count the latter? There are similar timing issues with costs, but also issues of what one counts in costs. Should one include the cost of interest on loans taken out to finance the company? How about the cost of dividends paid on the capital obtained from shareholders? Most definitions of costs include the former (interest) but not the latter (dividends), but the justification for this distinction is not clear. Investment is also clearly a cost, but for an asset which will last for more than one period (by definition – otherwise it would simply be treated as a current input). One should then include depreciation as a current year cost, but determining what that depreciation should be is not straightforward. And there are more complicated issues as well, such as how to include the cost of stock options provided to management. Finally and importantly, the law provides for a large range of various tax credits and tax deductions which are designed to provide special subsidies to various favored industries or owner categories. Different countries do this differently, and they of course change over time in any individual country as well. Such difficulties have created a profitable industry of lawyers and tax accountants with expertise on how, legally, to minimize recorded taxable corporate profits. Together with changes in the underlying law, this has led to the steady decline in corporate profit taxes paid as a share of corporate profits (as defined in the GDP accounts), to where the actual rate paid now is in fact only around 20% (with this including what is paid at the state and local level, as well as to foreign governments). Such factors also show why it is meaningless to compare the 35% rate in the US to that in other countries. Each country defines the portion of corporate profits that are treated as taxable in its own way, so the base to which the tax rate is being applied will differ across countries. Thus, while Trump has repeatedly asserted that US corporate taxes are the highest in the world, this is simply not true. One cannot look solely at the headline rate (35% in the US, which will be slashed to 21% in the new Republican tax plan). Indeed, based on what is actually paid, US corporate profit taxes at the headline rate of 35% are already lower on average than what is paid in most other OECD members. As a share of GDP, and using OECD data (where 2014 is the most recent year with comparable data for all members), corporate profit taxes were just 2.18% of GDP in the US. This was more than a quarter below the average of 3.00% of GDP across all OECD members. One cannot just focus on the 35% headline rate, but rather one must look at the system as a whole. How then to approach the taxation of incomes deriving from corporate activities? My primary recommendation is to “follow the money”, and tax such incomes at the level of the individuals receiving them. That is, the focus would be on a fair and progressive system of taxes on individuals receiving such income, with income to individuals from corporate sources taxed in the same way and at the same rate as income from any other source. How this would be done will be discussed in detail in the next section below, when we look at individual income taxes. But at the level of corporations, one would not separately tax the payments made by corporations (nor indeed any other business entity) to individuals liable for US income taxes. Rather, a Form 1099 would be filed by the company on what dividend payments they made and who they went to, as is in fact now done. And if the individual or entity is not subject to US income taxes (or has not told the corporation whether they are), the company would withhold taxes at the 35% rate, which the individual or other entity could later claim when they file their tax forms on US-source incomes. This is also as now. Thus, one would not tax at the level of corporations what they pay lenders for interest on loans (as is the case now, as interest payments are treated as a cost to the company), but nor also for what they pay as dividends to their shareholders (who, like lenders, have also supplied capital to the corporations). What would remain would then be profits that the corporation has retained rather than distributed (although with a provision for the cost of investment, to be discussed immediately below). These earnings, retained on the balance sheet and not invested in productive assets, would be subject to tax, and a 35% rate (as we have had prior to the new Republican tax legislation) would be reasonable. The income generated as a result of corporate activities would thus all be subject to tax, either at the level of the individual (if paid out) or at the level of the corporation (if, and only if, retained on the books). This would also ensure one is not leaving a loophole where incomes could be accumulated forever on the corporate balance sheet, and never be subject to the taxes that others are bearing. How then to treat investment? Investment is low in the US, and likely is a significant factor in why productivity growth has slowed in recent decades. As discussed in an earlier post on this blog, net private investment has declined in the US from over 7% of GDP between 1951 and 1980, to just half that now. Stagnant real wages have likely been a factor in this (why invest in new equipment if you can hire workers at low wages instead?). And while one will certainly want to take direct actions in the labor market to address this (most importantly by keeping the economy at close to full employment, thus strengthening the bargaining power of labor), tax policy can also contribute. As discussed above, profits are defined as revenues minus costs, but the costs will in principle include only the extent to which invested assets have depreciated. The problem in practice is that it is impossible to know what that depreciation really is, so our accounting systems use various simplified rules. An example is the frequently used method of straight-line depreciation, where the investment is depreciated at a fixed percentage of its original cost for each year of some assumed lifetime. But commonly, as part of tax policy, depreciation at some accelerated pace is allowed, thus reducing what is considered to be taxable corporate profits in the current period. Costs are treated as if they were higher, by the extent of the higher depreciation allowed under the tax law. This then reduces the share of actual corporate profits that are treated as taxable. One could extend this to the maximum limit and allow 100% of investment to be depreciated (or “expensed”) in the current year. Investment expenditures would be treated, in the period in which they are made, the same as any other input cost. This would greatly simplify the system, and also would provide a strong incentive to invest. One would then have that only those corporate profits which are retained on the balance sheet, and not invested in productive assets nor distributed either as interest or as dividends, would be subject to the corporate profits tax (at the 35% rate). This would be close to a cash flow definition of profits (treating interest and similarly dividends as a cost for the capital used by the company), and would be straightforward to measure. Corporate income taxes would only apply to those profits which are neither invested nor paid out as interest or dividends, but rather simply allowed to build up in bank accounts. Corporations operate across borders, both US firms with operations overseas and foreign-owned corporations with operations in the US. This raises special issues. We will first look at the former (operations of US firms overseas), and then the latter (foreign-owned firms operating in the US). The recently passed Republican tax legislation would partially exempt from US tax those profits earned by US companies on operations they undertake abroad. But there is no logic in this – why should their operations overseas be taxed at a lower rate than the same operations would be had they been located in the US? And it would also create a tremendous incentive for US companies to shift their operations to overseas locations, preferably to some tax haven. Why this would be considered as something good for American workers is not at all clear. Rather, and to create a level playing field, the earnings on such overseas operations should be subject to tax in the same way as corporate operations on American soil are. And they should be subject to tax at the time such profits are generated, rather than deferred. One should recognize, again in the name of a level playing field, that corporate taxes paid abroad should count as a credit against their US taxes. This is to avoid what would otherwise be double-taxation (by both the country where the operations are being undertaken, and by the US), and is the standard practice in most of the countries where such operations exist (covered by double-taxation treaties). This is the same as now. But while the payment of such taxes to foreign governments should be recognized and treated as a cost of doing business there, what remains as income should be treated the same as if it were generated by operations in the US. There is also the issue of what to do about the existing stock of accumulated, untaxed, corporate profits now held abroad. Under US tax law (prior to the recent legislation), profits earned by US companies on overseas operations have not been treated as taxable in the US until such profits are repatriated to the US. This has created the incentive to keep those profits in overseas accounts and investments, with this summing to at least an estimated $2.6 trillion (for 322 of the Fortune 500 top US companies that disclosed such figures, as of end 2016). There is no rational economic reason why such accumulated earnings should benefit from a tax amnesty (whether in full or partial, as the new Republican tax legislation grants). Rather, the taxes due on those funds should be paid and no longer deferred, in accord with the tax reform plan being presented here (distributions to shareholders would be taxed at the level of the individual, investments expensed, and remaining funds not invested in productive assets would be taxed at the 35% rate). One could, however, provide for a multi-year period (of perhaps five years or so) to spread the impact. And keep in mind that the corporations cannot argue that they cannot afford to make such payments. Those assets (of over $2.6 trillion for a sub-set of the larger companies) are sitting in accounts abroad right now. Finally, there is the issue of how to treat profits from operations in the US of companies owned (wholly or partially) by overseas entities. The basic principle to follow, and to ensure a level playing field as well, is that they should be taxed the same as US owned companies would be. Note that any company operating in the US has to be incorporated in the US under US law (as is the case for companies operating in any country), and thus in principle are US companies. That is, Toyota or BMW car plants in the US are operated by US incorporated subsidiaries owned by (or primarily owned by) Toyota of Japan and BMW of Germany. But their foreign ownership raises special issues. Such subsidiaries will generally transfer as “dividends” the profits they generate to their foreign parents. But there are other ways (perhaps not always so obvious) to pass along their profits. These include paying interest on loans provided by the corporate parent (possibly at especially high interest rates), or by paying royalties or licensing fees for patents, trademarks, or proprietary designs coming from the parent companies. All such transfers to corporate parents should be treated similarly as dividends. Taxation of such entities should again follow the “follow the money” principle. To the extent any such payments (whether dividends, interest, or royalties or licensing fees) paid to corporate parents (or to other entities where there is an ownership interest) are made by the foreign-owned subsidiary in the US to US entities who themselves are subject to US taxes (whether individuals, or banks, or other corporate entities), the payments would be treated as a cost. The company would file (as US companies do) the Form 1099s that go to the IRS to inform them that such payments had been made. Tax would then be paid by those individuals or other US entities receiving such payments, on their regular tax forms and in accordance with what they individually owe. If the entity receiving the payment is not otherwise subject to US taxes (or has not told the company whether they are or not), the foreign-owned US subsidiary would withhold taxes that might be due, at the 35% rate. The individuals or other entities could later file US income tax forms to cover the US taxes they might owe (on these distributions together with that owed on any other activities that generated taxable income in the US), and claim as a credit the taxes withheld on their behalf. If they choose not to file US tax forms, the taxes withheld (at the 35% rate) would constitute the equivalent of corporate profit taxes being paid at such a rate on these US operations. Again, the point is a level playing field between US and foreign-owned companies operating on US soil. Finally, the tax code is riddled with special provisions that favor particular industries, sectors, or types of owners. They are provided through a variety of means, including accelerated depreciation provisions in certain industries or for certain types of investments, various tax credits and deductions, and exemption from profit taxation (fully or partially) for those in certain industries. Subsidies for certain of these activities might well be warranted. But if so, it would be less costly and more transparent to provide such subsidies directly, through the budget, rather than hiding them in the tax code. It should also be noted that with full expensing of investments allowed under the proposed new system, there will be built-in, and non-discriminatory, advantages provided to all investments. The favored treatment of certain industries and not others, through granting of accelerated depreciation provisions for certain investments and not others, will no longer matter as all industries would be able to deduct 100% of the cost of investment in the year the investment was made. This would include investments made in research and development, where 100% expensing has generally been allowed in recent years. Such R&D costs would still enjoy this, but so would other investments. As part of an overall reform of the corporate income tax, however, the many special, often industry specific, tax subsidies should end. We will examine below, in Section D, what the resulting savings from this might be. a) Corporate investment expenditures should be allowed to be fully expensed in the year they are incurred. b) Dividend distributions should be treated as an expense, as interest on loans is now. Together with full expensing of investment expenditures, this would imply that taxable corporate profits will equal what was retained that year and neither distributed (as dividends or interest) nor invested. Those retained earnings, accumulating in bank accounts on the corporate balance sheet, would be taxed at 35% in the year they are so retained. c) Companies would report the dividend distributions to individuals or other entities on Form 1099s, just like interest payments are now reported. If the individual or other entity has not provided their tax ID number to the company, then the company would withhold taxes on such distributions at the 35% rate. Foreign individuals or entities would be treated similarly, with the taxes withheld, which they could then claim credit for if they file US tax forms covering all their US source incomes. d) Taxable corporate profits (as defined here) would apply not just to US-based operations, but also to the operations of US companies abroad. That is, the taxation will be the same on a worldwide basis, and there would be no tax incentive to relocate operations to some foreign jurisdiction. Like now, corporate income taxes paid in countries where double-taxation treaties have been negotiated would count as a credit. e) Profits of US corporations that have accumulated abroad (of an estimated $2.6 trillion for a sub-set of the larger companies) would be subject to a one-time tax on the same basis as retained earnings would now be. One could allow a multi-year period, of perhaps five years, to spread this out. f) The US subsidiaries of foreign corporations would report (on Form 1099s or their equivalent) any distributions they make. These would include payments of dividends or interest, but also royalties and licensing fees paid to corporate parents (or other entities with an ownership interest). For foreign entities receiving such distributions that are not otherwise subject to US taxes, or in cases where the entity has not provided notice of their US tax status, the companies would withhold taxes at a 35% rate. g) Special tax subsidies for particular industries or purposes granted through the tax code should end. To the extent any such subsidies are warranted as a matter of public interest, it would be less costly to provide them directly and transparently through the budget. These reforms would have a major impact on what is collected as corporate income taxes. As we will see below, income taxes paid directly by the corporations themselves would indeed be reduced. But this would in large part be a consequence of the shift of the locus at which such incomes are taxed, from the corporate level to the individuals receiving those incomes. One therefore needs to look at the revenue impact of these together, which we will do in Section D below after first discussing proposed reforms to individual income taxes. f) Tax subsidies for special, favored, private business activities should end. Any such subsidies which are warranted can be provided at lower cost through the budget. I have discussed the first three reforms on the list above in an earlier post on this blog. Those interested in further detail on those measures may refer to that earlier post. However, I will try to ensure the discussion here is sufficient to keep this post self-contained. Taxing all forms of income the same is a matter not only of basic fairness, but also for reasons of tax efficiency and simplification. To be clear, this does not mean one tax rate for all, but rather that income of one type (say wages) should be taxed the same as income from another source (such as capital gains). Under the current US system a person will pay tax at different rates depending on the source of that income: of up to 39.6% (37% in the recently passed legislation) on what is deemed “ordinary income” (such as wages), of up to 20% on income from capital gains on assets that have been held for more than a year, of also up to 20% on dividends paid on equity shares held for more than 60 days (but not on interest paid by those same companies), of up to 28% from capital gains on “collectibles” and certain small business stock, and of up to 25% from “unrecaptured Section 1250 gain” (whatever that is; I believe it is something primarily to do with real estate). But this is not all. In addition to such basic rates, there are various add-ons that raise the actual or effective rates for certain households. For example, there has been a net investment income tax (applying to all forms of investment income, including capital gains as well as interest, dividends, rent, and so on) of 3.8% for households with incomes above $250,000 (when married filing jointly). There is also an additional tax for Medicare of 0.9% for wage and self-employment income for households with income above $250,000 (when married filing jointly). This is on top of the regular Medicare tax of 2.9% on all wage income (half technically “paid” by the employer and half by the individual, with the full 2.9% applying for the self-employed). And then to add even further complexity, personal exemptions and itemized deductions are phased out for higher-income households (of more than $313,800 if married filing jointly in 2017). These are called the PEP and Pease phase-outs, respectively, and act in effect as a higher tax rate on such households up to a certain amount that varies by household (depending on the number of personal exemptions and the value of their declared deductions). Households who are extremely rich, with incomes above these phase-out amounts, then effectively pay a lower income tax rate than these more moderately well-off households pay. The phase-outs raise the effective income tax rate paid by such households by about 1% point for the itemized deductions phaseout (or a bit more if one accounts for interaction effects), and by about 1% point for each personal exemption (thus 2% for a household of two, or 5% for a household of five, and again a bit more with interaction effects). Finally, on top of all this is the Alternative Minimum Tax, which applies to moderately well-off households, excludes certain exemptions and deductions (in whole or in part), and then taxes the resulting taxable income (as then defined) at a rate of 26% or 28%. This is incredibly complex, and for no justifiable purpose other than possibly an intention to obfuscate what rate is actually being paid. And the complication does not come from the number of income tax brackets, but rather from taxing different forms of income differently, each with its own set of tax rates and tax brackets. This is not only complex to figure out, but also provides an incentive to try to shift one’s income to a category that is taxed at a lower rate. Thus, for example, suitably structured payments of stock options to high-level managers and other insiders allow them to switch what would otherwise be wage income (taxed at rates of up to 39.6% up to now) to long-term capital gains (taxed at 15% or 20%). Similarly, managers of investment funds are able to structure the payments they receive from successful deals (which they call “carried interest”) at the low capital gains rate, even though they have no money of their own invested and are being compensated for their work in putting together the deals. The recently passed Republican tax plan does not address this fundamental cause of complexity in the individual income tax system. While some aspects would change (e.g. there would no longer be any personal exemptions, and hence no issue of personal exemptions being phased out), it would also create a new, highly favorable, treatment of what is termed “pass-through” income, that individuals obtain from businesses organized as partnerships, sole proprietorships, sub-chapter S corporations, and similar entities. Currently, such income is treated the same as other ordinary income (such as wages) and is taxed as ordinary income is. But under the new legislation, those in certain professions (but not others, where the rationale for including certain professions and not others is not clear), will be able to reduce their tax rate by 20%. That is, those in the favored professions (and meeting certain other conditions), would be able to reduce the tax due on such income from the 37% others pay to just 29.6%. This would create a strong incentive for such well-off individuals to structure the payments they receive for their work in such a way as to benefit from this lower rate (as the University of Kansas men’s basketball coach did when Kansas started to exempt such pass-through income from the state income tax). Trump himself would be a prime beneficiary of such a “reform”. 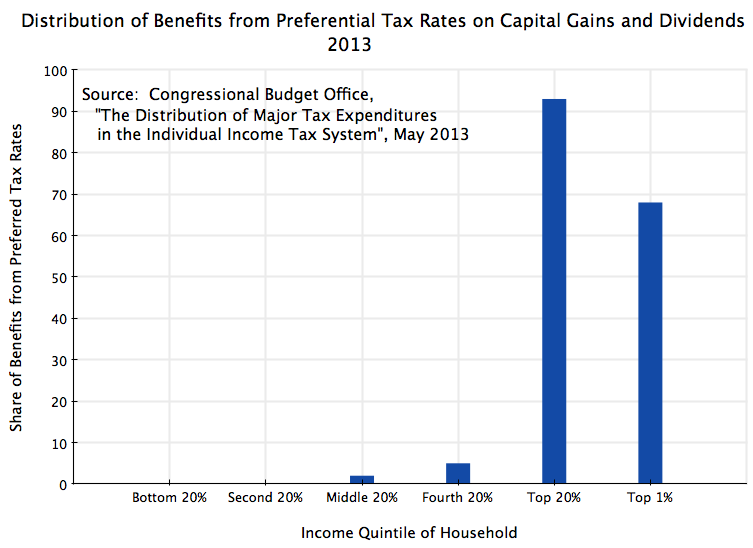 The Congressional Budget Office, in a May 2013 report, estimated that fully 93% of the benefit of the preferential tax rates on capital gains and dividends accrued to the richest 20% of households (those with a minimum income of $162,800 for a family of four), and over two-thirds (68%) accrued to the richest 1% (those with a minimum income of $654,000 for a family of four). This is a special tax benefit that overwhelmingly favors the rich. Taxing all forms of individual income the same thus would not only greatly simplify the system, but would also be distributionally positive. And it would be fair, as individuals would pay the same tax on the same total income, regardless of whether they received that income in one form (e.g. wages) or another (e.g. capital gains or dividends). One issue that would need to be addressed would be to ensure all the income and gains are taxed in terms of today’s prices. This is not a problem for income received in the last year. One just adds up the various sources of income. But for capital gains on assets held for a number of years, accumulated general inflation can be a significant factor. However, it would not be difficult to take account of this. Each year, the IRS would publish a table for accumulated general inflation from any given prior year to today, and these tables would be used to adjust the cost basis of the assets to reflect today’s price level. A simple example will illustrate what would be done. Suppose you sold shares in some company for $300,000 now, which you had bought for $100,000 ten years ago. The nominal gain would be $200,000. However, a significant share of this reflects inflation. Suppose, in this example, that inflation had averaged 2.0% per year over the ten years. Compounded, cumulative inflation over this period would then be 21.9%, and the $100,000 spent for the asset ten years ago would be equal to $121,900 in today’s prices. The taxable gain in today’s dollars would then be $178,100. One would add that amount to your other earnings this year to determine what your total taxable earnings are this year, in terms of today’s prices. This would not add any real complication. One already must know the cost basis as well as the date the asset was acquired, and indeed, these are entered on our tax forms. One would just then need to multiply the cost basis by the inflation factor provided by the IRS to reflect the cost in today’s prices. Another category of income that is taxed differently than other categories of income is interest income from bonds issued by state and local governments (commonly called municipal or “Muni” bonds), as well as Private Activity Bonds (PABs) that are treated similarly. Interest on such bonds is taxed at a special rate of zero (i.e. they are not taxed) at the federal level, and similarly not taxed at the level of most states and localities (for citizens of those jurisdictions). With the interest income on such bonds not taxed federally (nor locally), the bonds can be issued at a lower interest rate. The market will be able to issue such bonds at a rate of, for example, say 4%, when similar bonds (with similar risks) can only be sold with an interest rate of say 6%. If one is in a 40% tax bracket, taxable interest earnings at 6% will equal 3.6% after taxes, so a similar risk bond paying 4% with no taxes due will be attractive. This is done as a means to provide federal subsidy support to states and localities as they fund their investments and programs, but it is a terrible way to do it. The federal subsidy comes from the federal tax revenue that is given up by allowing such bonds to be issued tax-free. But it would cost less to the federal treasury if such subsidies were provided directly to the states and localities, rather than indirectly through this tax avoidance mechanism. The reason is that such bonds will be sold in the market at that price where the interest paid by them will match what the marginal individual buying such bonds would receive, after taxes, from a regular, taxable, bond of similar risk and maturity. At that price, the marginal individual buying such bonds would be indifferent between the two types of bonds. They would receive the same, after tax, interest on each. This would normally be for someone in one of the middle tax brackets. Someone who is richer than that, in one of the higher tax brackets, will then receive a windfall gain equal to the difference between what they will earn from the tax-free bond, and what they would earn (after taxes) had the bond not been tax-free. In the example above, the windfall to someone in the 40% bracket would equal the difference between the 3.6% and 4.0% interest rates, times the value of such bonds that they hold. This is a direct windfall to the rich, and only the rich. It would be cheaper for the federal government to provide the subsidies directly to the states and localities, if such subsidies are warranted. Private Activity Bonds have the same problem, as the interest on them is also tax-free. The original logic appears to be that such bonds would be used to finance infrastructure and other expenditures that states and localities have traditionally funded, but the allowable purposes for which such PABs can now be used is much broader. They are used for many real estate development projects, for some housing, for investments in “qualified enterprise zones”, for certain mortgages, and even for certain manufacturing and farm investments. They can be used for pro sports stadiums and arenas (although not for luxury skyboxes built in them). But while there are guidelines for the allowable purposes, there appears to be a good deal of discretion at the local level on what qualifies as eligible, and politically well-connected actors undoubtedly have an advantage in receiving such local approvals. But even aside from whether PABs may be used for questionable purposes, they suffer from the same inherent excessive cost as Muni bonds do. If it made sense for the federal government to subsidize such activities, it would be cheaper to subsidize them directly through the federal budget. Providing the subsidy by granting such bonds tax-free treatment leads to a windfall going directly to the rich in the higher tax brackets. To sum up, in replacement of the current complex system where different forms of income are often taxed differently, requiring different taxes to be computed on each and with resulting interactions among them, one should simply add up incomes earned each year from all sources (in current year prices), and pay a progressive tax on the total. Under the current system, the cost to someone in, say, a 40% tax bracket for a $100 contribution to some charity is only $60. The charitable contribution is tax deductible, and hence the federal government is compensating someone in the 40% bracket $40 for the contribution to that charity. But someone in the middle class in, say, a 20% tax bracket, would only receive a $20 compensation from the federal government for a $100 contribution to that exact same charity. It would cost them a net $80. And someone even poorer, in a 10% tax bracket would receive only $10 back, so it would cost them $90 for a contribution to that exact same charity again (assuming they itemize deductions; if not, it would cost them the full $100). This is not fair. The richer are receiving a bigger gift from the federal government for a $100 contribution to the same charity that the others have also contributed to. There is also no reason of practicality why the system needs to be structured in this way. Instead, one would simply add up all deductions (as now on Schedule A of the Form 1040), plus whatever amounts are set for personal exemptions ($4,050 per person in the household in 2017). Then, instead of deducting this total from gross income, with the tax then determined based on the various tax rates, one would deduct some share (perhaps 25%, but the same for everyone) as a credit from taxes due. That is, one would first determine taxes due on gross income, and then treat as a tax credit some fixed percentage of the total of what is now treated as deductions and exemptions. As part of this, one would also eliminate the PEP and Pease phase-outs which in effect make those who are moderately well-off pay a higher tax rate than what they are nominally obliged to pay (and a higher rate than what those who are even wealthier have to pay). This just complicates the system. It is better to set the rates openly and clearly, and keep the rates progressive. Under the proposed system, a $100 contribution to some charity would in effect then cost the taxpayer $75 (if a 25% rate is used) whether or not the person is rich, middle class, or poor. The rate to be used, 25% in the examples here, could be set at that level which would be neutral in terms of the overall impact on tax collections. It would in effect be a weighted average of what applies now to everyone in all tax brackets. One would also apply the same rate of 25% (or whatever) to the amount used for the standard deduction ($12,700 in 2017 for couples filing jointly), as well as to personal exemptions ($4,050 per person in 2017), and then treat them all similarly as a tax credit. One would do this primarily to be fair to all. But it would also simplify the system. Taxes are paid on the income obtained from capital gains when assets are sold. The gain is equal to the difference between the price received for the asset, and the price paid for it at some time before (the cost basis). As discussed above, as part of a general tax reform the cost basis should be adjusted for general inflation between when the asset was purchased and when it was sold (and then taxed at the same rate as any other source of income), but the principle remains that taxes are paid on the income received from buying and selling assets. There is, however, an exception to this in the current tax system (and would remain an exception in the new Republican plan). When an asset is received via inheritance, the cost basis is reset to what the value of the asset is at the time it is inherited. That can be a major favor to those inheriting assets, and there is no justifiable reason for it. Some have argued that the person inheriting the asset would not necessarily know the cost basis, but that could be easily remedied. First, the cost basis for financial assets traded through some broker such as Fidelity or Merrill Lynch will be recorded by that broker (and is reported to the IRS when the asset is sold). And the value at which real estate is bought and sold will be recorded by the local government and kept in its land records forever. Thus one will normally have the cost basis independently, from third-party sources. But should there be any other asset where there might not be an independent record of the cost basis, or should the cost basis change for some valid reason (such as for a major capital improvement in some real estate asset), one could always make sure the correct cost basis is recorded in an annex or something similar in any wills or trusts that convey the assets to the beneficiaries. Or that annex could indicate where to go to find the papers with the cost basis. Indeed, it would be good practice anyway to record those values (or where to go to find the values) in such documents for all assets being passed to heirs. Another argument that might be made is that those inheriting the assets might not be able to afford to pay the tax if the income received is calculated based on the original cost basis of the asset, rather than a stepped-up value. But this would be a confused argument. First, the tax due would not arise until the asset is sold, which could be many years later. And second, when the asset is sold those inheriting the asset will receive a payment for the full amount of the sale. One will have the funds to pay any tax that is then due. 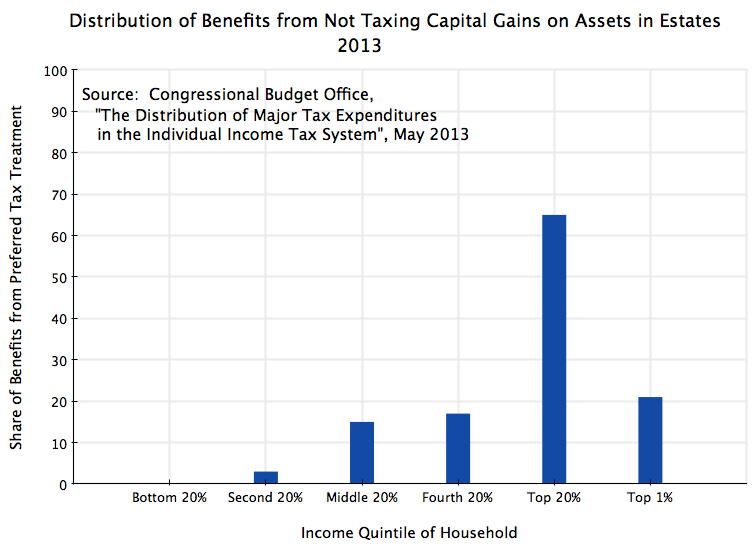 While not so extremely skewed distributionally as the benefit gained from the low rate of tax on long-term capital gains (discussed above), two-thirds of the benefits of this tax provision still go to the richest 20% of households, and over 20% of the benefit goes to the richest 1%. As part of a general tax reform, this provision should be eliminated. The cost basis of assets should remain at whatever it had been, and not stepped-up at the time the asset is inherited to whatever the value is then. The estate tax is now paid by only a tiny percentage of high net worth estates, because the exemption level has been raised over time to extremely high levels. In 2017, estates with a net taxable value (after contributions to charity) of $5.49 million (or $10.98 million for married couples, if some standard arrangements have been made) are subject to this tax. Because this exemption level is now so high, and with other ways as well to avoid estate taxes (such as use of life insurance, to be discussed below), only a small percentage of estates, less than 0.2%, end up paying any estate tax at all. And under the recently passed Republican tax legislation, these floors on what is taxed would double, to $22 million for a married couple. Only an exceedingly small share of estates will need to be concerned with this tax. Until the tax cuts passed in 2001 under George W. Bush, the exemption level of estates had been far less. It was raised as part of those tax cuts from $675,000 in 2001 to $1.0 million in 2002-03, and then by phases to the current $5.49 million (for 2017). Indeed, in one year (2010) it was removed altogether. Its complete removal has long been a goal of Republican leaders. Returning the floor of what is subject to tax to $1.0 million for individuals and $2.0 million for married couples (with this inflation indexed going forward) would restore it to where it roughly was (in terms of today’s prices) from the mid-1980s through the 1990s. Based on what was observed in the late 1990s, it would apply only to the richest 2% of households, approximately. And this 2% share is indeed less than what the share was for most of the post-World War II period. On average, a bit over 3% of estates were subject to the tax between 1946 and 2001. There is no evidence that this tax at those levels did any harm to the economy. A common “tax planning” tool used by the very wealthy to evade estate (and any other) taxes on assets passed to their heirs has been the use of life insurance. Life insurance proceeds are not subject to tax. For those who use life insurance for its intended purpose (to provide for family members and other dependants in case of an unexpected death), this is reasonable. It should not then be subject to tax. But its use to evade estate taxes should not be allowed. One would then need to distinguish between these two purposes, and the question is how. That could be done in various ways. One could establish certain criteria, such as that both the age of death at which it would apply would be the normal retirement age or greater (say at age 66), plus that those receiving the insurance proceeds would be individuals other than the spouse or non-adult dependants of the deceased, plus that the amount in total to be paid out would (together with other estate assets) exceed the exemption level for estates subject to tax (which would be, as proposed above, $1.0 million for individuals and $2.0 million for married couples). Using life insurance proceeds as a tax planning tool to allow extremely large estates to pass tax-free to heirs is a loophole which evades the intent of the estate tax. It should be closed. Finally, like the corporate income tax, the individual income tax provides special tax subsidies for various private business activities. These include special deductions for certain “domestic production activities” (defined somehow in the tax code), favorable treatment of income earned abroad, and special advantages from the sale of certain categories of business stock. While various subsidies to clean energy sources and energy efficiency are also included here, they are only a small share of the total – less than 10%. To the extent such subsidies serve a valid public purpose, it would be less costly and more transparent to provide them directly and explicitly through the budget. But many of these subsidies would not survive such public scrutiny. They should be ended. I should emphasize that these are very rough estimates. I will discuss below the various sources and assumptions made to arrive at these figures, but would stress that the information available to make such estimates is limited, and also does not take into account interaction effects nor how agents would react should such reforms be enacted. Because they are rough, I have rounded each of the estimates to the nearest $50 billion (for the ten-year totals). Nevertheless, the figures should suffice to give a sense of the magnitudes, and how the individual impacts would add up. I have also excluded here what would be a significant, but one time, source of tax revenues under the proposed reforms. Specifically, I have left out from the estimates here the taxes that would be paid on the accumulation of profits held overseas, on which taxes otherwise would have been due in the past had those profits been repatriated to the US. As noted above, those untaxed profits are estimated to total $2.6 trillion for a subset of the larger US companies (the subset where data could be obtained for an estimate). Those up-to-now untaxed profits would be subject to a 35% tax to the extent they are not either distributed to shareholders (in which case they would then be taxed at the individual level, at that individual’s rate) nor invested in productive assets (as investments could be fully expensed). It is impossible to say how companies would then respond, but if they did nothing, a 35% tax on $2.6 trillion would total $910 billion. This would be a significant addition to the ten-year totals. But it is one time (perhaps spread, as discussed above, over a five year period), plus companies would be expected to respond in some way. Thus I have left this figure, significant though it might be, out of the totals here. Rather, the focus is on what the on-going, long-term, impacts might be of the tax reforms. On the sources: Most of the figures are derived from the most recent (January 2017) estimates of tax expenditures published by the Joint Committee on Taxation (JCT) of Congress. The JCT publishes such estimates annually, and cover around 250 individual items. Most are quite small, but they add up. The report shows them separately for corporations and for individuals, and by year although only for the five years of FY2016 through FY2020 in their most recent report. To scale them to the fiscal years of FY2018-27 (to make them comparable to the years discussed in the Republican tax legislation), I rescaled the totals for each category to FY2018-27 by multiplying them by the ratio of the Congressional Budget Office June 2017 forecasts of corporate or individual income tax revenues for FY2018-27 to what CBO is forecasting for FY2016-20 (separately for the corporate income tax and for the individual income tax). Adjustments were needed for two of the proposed reform items. The JCT estimates of the impact of the special, low, capital gains tax rate applied to long-term capital gains and qualified dividends, is based on figures which do not reflect inflation indexing of the cost basis for long-term capital gains. Such inflation indexing would reduce the revenues collected significantly, but we do not have the data needed to provide a good estimate of how much. To arrive at the figure shown here, I first took out the qualified dividends share of the total taxed at the capital gains rate (where published IRS data shows that in 2015 the share was 31%), as such dividends are paid in the current year. The remainder reflects actual long-term capital gains. Arbitrarily but generously, I assumed such capital gains would be reduced by 50% due to inflation indexing of the cost basis. I suspect this is on the high side – the true reduction is likely to be less. But based on this assumption, I arrived at the figure shown in the table. The second item in the JCT estimates that needed to be adjusted was the impact of no longer treating as tax-free the payments made under life insurance. As discussed above, some life insurance is used as a genuine tool to manage the financial risk of losing a provider for the family. But life insurance is also used as an estate planning tool by wealthy estates to convey, tax-free, the assets from an estate to heirs, and thus avoid the estate tax. In terms of dollar volumes, this latter use likely dominates. One would want to design the tax only to apply to the latter, which could be done through various ways (using age, who the heirs would be, and a large minimum size). For the purposes of the calculation of the tax revenue impact of such a reform, I assumed that the revenues generated would be reduced to 80% of the JCT estimates, as life insurance for the management of the financial risk of losing a family provider would remain tax exempt. The January 2017 JCT report on tax expenditures did not have estimates for three of the tax items. One was what the impact would be from allowing 100% expensing of all corporate investment. However, a recent (November 14) JCT analysis of the tax revenue impacts of the House Republican tax plan did include, as a separate item, the cost of a proposed 100% expensing of corporate investment. While this expensing (under the then House Republican plan) would formally end in 2022, one can use the estimates shown for a separate 100% expensing item (for small business) to calculate what it would roughly be in the second half of the decade (the relative proportions would be similar). Note that the net tax revenue impact of 100% expensing diminishes over time. Full expensing essentially brings forward allowed depreciation, so instead of spreading depreciation over time, the asset is treated as if the full cost was borne in the initial period. This reduces taxable profits in the initial year, but then will raise it later (as the full depreciation has already been taken). The second was the cost of returning exemption levels for estates to $1.0 million for individuals and $2.0 million for married couples. This was estimated based on figures from the Tax Policy Center on the revenues collected by this tax in the late 1990s (but converted into revenues in today’s prices), when the exemption levels then (in terms of today’s prices) were close to the proposed new levels. They were then forecast going forward to grow at the same rate as what the Congressional Budget Office forecast for the estate tax under current law. The net increase in revenues would then equal the difference between this stream of tax revenues (with the exemption levels at $1.0 / $2.0 million) and what the CBO is forecasting the revenues would be under current law. Finally, the impact of shifting the taxation of dividends from the corporate level to the individual level (where it would be taxed at the same rate as other income) was estimated based on current figures from the GDP accounts on corporate dividends, less Tax Policy Center estimates on the share going to foreigners, with this then forecast to grow at the same rate as what the JCT is forecasting for dividends and capital gains. The resulting figures are shown in the table, with each rounded to the nearest $50 billion. The net impact of the reforms on what would be collected directly through the corporate income tax would be a decline of $250 billion over the next ten years. There would be a reduction in taxes collected at the corporate level of $2.5 trillion from excluding dividends from taxable corporate profits, and a reduction of $200 billion from allowing investment to be 100% expensed. But this would mostly be offset by ending the deferral of taxes on income earned abroad by US corporate subsidiaries (generating $1.5 trillion in revenues), and by ending corporate subsidies for various special industries and activities (generating $950 billion). Income tax collected at the individual level would, however, grow by an estimated $2.7 trillion over the ten year period. The largest component of this ($1.15 trillion) would be generated by taxing capital gains and dividends at ordinary income tax rates, rather than the special low rate (20% generally) they are granted now. Taxing interest on state and local government bonds (Munis) as well as private activity bonds (PABs), rather than not taxing them at all, would generate $700 billion over the ten years. Ending the step-up of cost basis on assets received via inheritance would generate $450 billion, while returning the exemption level for the estate tax to $1.0 million for individuals and $2.0 million for married couples would generate $500 billion. Taxing large life insurance proceeds from estates, used to evade estate taxes, would generate an estimated $250 billion. And ending special tax subsidies to individuals for favored private business activities would generate $250 billion. Partially offsetting this, ending the surtax on certain rich households on investment income (so that it would be taxed the same as other income) would mean a reduction of $400 billion in tax revenues over the decade. And ending the complication of the PEP (personal exemption) and Pease (itemized deductions) phase-outs would reduce revenues by an estimated $250 billion. Adding the impacts on both the corporate income tax and the individual income tax, the net effect would be to raise tax revenues collected by an estimated $2.45 trillion over the ten years. This is large, and can be contrasted with the loss of $1.5 trillion in tax revenues that would follow from the recently passed Republican tax plan. Even if several of my revenue estimates turn out to be too optimistic, the $2.45 trillion increase in revenues leaves a generous margin for uncertainties. The net impact of these tax reforms would almost certainly be budget positive. But assuming the $2.45 trillion surplus is a reasonable estimate, what could be done with such an amount? First, I would note that some of the savings would come from ending various subsidies through the tax system. As discussed above, providing such subsidies through the tax system is both costly (it would cost less to provide the subsidies directly through the budget, as the current system provides a windfall to those in the higher tax brackets) and lacks transparency. Many of these subsidies should cease altogether, but some might well serve a valid public purpose. When this is the case, regular budget expenditures would rise, and one should use a portion of the $2.45 trillion for such expenditures. One might also wish to use a portion of the $2.45 trillion for other urgently needed budget expenditures the nation requires, such as for infrastructure. As discussed in prior posts on this blog, government expenditures have been squeezed for many years, leaving a backlog of high priority needs. One might also use a portion of the $2.45 trillion to pay down part of the national debt, although the priority of this is not clear. Even the supposedly fiscally conservative Republicans see no problem with voting for a tax plan that would reduce tax revenues by $1.5 trillion over the next decade. Finally, one could use the $2.45 trillion to adjust income tax rates downward. If the full $2.45 trillion were used for this, and if one were to apply the reduction in proportion to current rates (as of 2017), one can calculate (using the CBO forecasts of tax revenues under current law), that the top tax rate could be cut from the current 39.6% to a rate of 35.6%. The other tax rates would be similarly reduced (proportionally). This would even be close to the top rate of 35% that the Republican plans have been aiming for (at various times), but would have been achieved as a consequence of true reforms. That is, rather than setting a rate target (of 35% or whatever) and then trying to find sufficient measures to allow this to be met (including allowing for a net revenue loss of $1.5 trillion), the approach of a true reform is to start with several basic principles (uniform tax rates on all forms of income, progressivity, and simplification), work out what reforms would follow from this, and then set the rates accordingly for revenue neutrality. The recent debate on tax policy was an opportunity to enact a true reform. We certainly need it. The current tax system is inequitable, overly complicated, has provisions which induce perverse behavior, and is costly to administer. Sadly, the recently passed Republican tax plan will make it worse, as just the example of the special treatment of pass-through income makes clear. The new law introduces new inequities (pass-through tax provisions that favor a narrow few), new complications (distinctions that cannot be logically explained as to whom will be able to cut their taxes on pass-through income, such as professionals in real estate but not certain others), provisions that will induce perverse behavior (such as newly-created business structures for doctors to sell and lease back their offices, in order to obtain some of the pass-through benefits that real estate companies will enjoy), and will be costly to administer (as the IRS tries to ensure the law is applied as intended despite the numerous complications, as for example again with regard to who will and will not be allowed to benefit from the tax cuts for pass-through income). And the complications and inequities in the new Republican tax legislation extend far beyond what was done on pass-through income. Many new loopholes have been created, and the tax cuts provided have gone disproportionately to the rich. Along with differing treatments of different sources of income, the new system will be more complex than the old, and less progressive. Finally, it will not be revenue neutral. Rather, it will lead to $1.5 trillion more being borrowed in our budget over the next ten years. Our budget is in deficit and will remain so if nothing is done, even though now is the time, with the economy at full employment, that one should be moving to a budget surplus. In effect, we are borrowing a further $1.5 trillion over the next decade to hand out primarily to the rich. In a simple and fair system of taxation, one would be paying the same in taxes whether one’s income came from working for wages, from business income, from dividends from corporations or interest from loans, from stock options, or from capital gains. Under our current tax system, each of these sources of income may be taxed at different rates. The result is undue complication, as one has to determine not only what total income is but also how it should be categorized. But in addition there are interaction effects, where the tax applied in some category depends not only on the income earned in that category, but also often on the income earned in other categories. And most importantly, there is then the incentive to try to arrange income payments so that they will come under a category where lower taxes are due (e.g. shifting wage income to stock options, or for hedge fund managers to shift what would be wage income to “carried interest”). The new Republican tax plan will make this worse. Now there is a new general category treated preferentially, of pass-through income. Pass-through income had been taxed before the same as wage and other ordinary income. Now it will be taxed 20% less. This is a strong incentive, for those who are able, to try to arrange the payments they receive to qualify as pass-through income rather than wages. This is just a gift to the wealthy who are able to obtain such special treatment. But there is no disagreement that a true tax reform is certainly needed in the US. The proposals outlined above show what could have been done. And such a reform now is more important than ever, as the Republican tax plan has moved us in the opposite direction of what we needed. It is well known that with current Social Security tax and benefit rates, the Social Security Trust Fund is projected to run out by the 2030s. The most recent projection is that this will happen in 2034. And it is commonly believed that this is a consequence of lengthening life spans. However, that is not really true. Later in this century (in the period after the 2030s), life spans that are now forecast to be longer than had been anticipated before will eventually lead, if nothing is done, to depletion of the trust funds. But the primary cause of the trust funds running out by the currently projected 2034 stems not from longer life spans, but rather from the sharp growth in US income inequality since Ronald Reagan was president. Had inequality not grown as it has since the early 1980s, and with all else as currently projected, the Social Security Trust Fund would last to about 2056. This particular (and important) consequence of the growing inequality in American society over the last several decades does not appear to have been recognized before. Rather, the problems being faced by the Social Security Trust Fund are commonly said to be a consequence of lengthening life expectancies of Americans (where it is the life expectancy of those at around age 65, the traditional retirement age, that is relevant). I have myself stated this in earlier posts on this blog. But this assertion that longer life spans are to blame has bothered me. Social Security tax rates and benefit formulae have been set based on what were thought at the time to be levels that would allow all scheduled benefits to be paid for the (then) foreseeable future, based on the forecasts of the time (of life expectancies and many other factors). Thus it is not correct to state that it is longer life spans per se that can be to blame for the Social Security Trust Fund running out. Rather, it would be necessary for life spans to be lengthening by more than had been expected before for this to be the case. This blog post will look first at these projections of life expectancy – what path was previously forecast in comparison to what in fact happened (up to now) and what is forecast (now) for the future. We will find that the projections used to set the current Social Security tax and benefit rates (last changed in the early 1980s) had in fact forecast life spans which would be longer than what transpired in the 1980s, 1990s, and 2000s. That is, actual life expectancies have turned out to be shorter than what had been forecast for those three decades. However, life spans going forward are currently forecast to be longer than what had been projected earlier. On average, it turns out that the earlier forecasts were not far off from what happened or is now expected through to 2034. Unexpectedly longer life spans do not account for the current forecast that the Social Security Trust Fund will run out by 2034. Rather, the problem is due to the sharp increase in wage income inequality since the early 1980s. Only wages up to a ceiling (of $118,500 in 2016) are subject to Social Security tax. Wages earned above that ceiling amount are exempt from the tax. In 1982 and also in 1983, the ceiling then in effect was such that Social Security taxes were paid on 90% of all wages earned. But as will be discussed below, increasing wage inequality since then has led to an increasing share of wages above the ceiling, and hence exempt from tax. It is this increasing wage income inequality which is leading the Social Security Trust Fund to an expected depletion by 2034, if nothing is done. This blog post will look at what path the Social Security Trust Fund would have taken had wage inequality not increased since 1983. Had that been the case, 90% of wages would have been covered by Social Security tax since 1984, in the past and going forward. But since it is now 2016 and we cannot change history, we will also look at what the path would be if the ceiling were now returned, from 2016 going forward, to a level covering 90% of wages. The final section of the post will then look at what would happen if the wage ceiling were lifted altogether so that the rich would pay at the same rate of tax as the poor. One final point for this introduction: In addition to longer life spans, many commentators assert that it is the retiring baby boom generation which is depleting the Social Security Trust Fund. But this is also not true. The Social Security tax and benefit rates were set in full knowledge of how old the baby boomers were, and when they would be reaching retirement age. Demographic projections are straightforward, and they had a pretty good estimate 64 years ago of how many of us would be reaching age 65 today. Life expectancies have been growing. But this has been true for over two centuries, and longer expected life spans have always been built into the Social Security calculations of what the Social Security tax rates would need to be in order to provide for the covered benefits. The issue, rather, is whether the path followed for life expectancies (actual up to now and as now expected for the future) is higher or lower than the path that had been expected earlier. What we have seen in recent decades is that while life spans for those of higher income have continued to grow, they have increased only modestly for the bottom half of income earners. Part of the reason for this stagnation of life expectancy for the bottom half of the income distribution is undoubtedly a consequence of stagnant real incomes for lower income earners. As discussed in an earlier post on this blog, median real wages have hardly risen at all since 1980. And indeed, average real household incomes of the bottom 90% of US households were lower in 2014 than they were in 1980. Thus it is an open question whether life spans are turning out to be longer than what had been projected before, when Social Security tax and benefit rates were last adjusted. The most recent such major adjustment was undertaken in 1983, following the report of the Greenspan Commission (formally titled the National Commission on Social Security Reform). President Reagan appointed Alan Greenspan to be the chair (and later appointed him to be the head of the Federal Reserve Board), with the other members appointed either by Reagan or by Congress (with a mix from both parties). The Greenspan Commission made recommendations on a set of measures (which formed the basis for legislation enacted by Congress in 1983) which together would ensure, based on the then current projections, that the Social Security Trust Fund would remain adequate through at least 2060. They included a mix of increased tax rates (with the Social Security tax rate raised from 10.8% to 12.4%, phased in over 7 years, with this for both the old-age pensions and disability insurance funds and covering both the employer and employee contributions) and reduced benefits (with, among other changes, the “normal” retirement age increased over time). The chart shows the forecasts (in blue) used by the Greenspan Commission (which were in turn taken from the 1982 Social Security Trustees Report) overlaid on the current (2015, in red) history and projections. The life span forecasts used by the Greenspan Commission turned out actually to be substantially higher than what were the case or are forecast now to be the case for females to some point past 2060, higher up to the year 2000 for males, and based on the simple male/female average, higher up to about 2010 for all, than what were estimated in the 2015 report. For the full period from 1983 to 2034 (using interpolated figures for the periods when the 1982 forecasts were only available for every 5 and then every 10 years), it turns out that the average over time of the differences in the male/female life expectancy at age 65 between the 1982 forecasts and those from 2015, balances almost exactly. The difference is only 0.01 years (one-hundreth of a year). For the overall period up to 2034, the projections of life expectancies used by the Greenspan Commission are on average almost exactly the same as what has been seen up to now or is currently forecast going forward (cumulatively to 2034). And it is the cumulative path which matters for the Trust Fund. Unexpectedly longer life expectancies do not explain why the Social Security Trust Fund is now forecast to run out by 2034. Nor, as noted above, is it due to the pending retirement of more and more of the baby boom generation. It has long been known when they would be reaching age 65. Why then, is the Social Security Trust Fund now expected to run out by 2034, whereas the Greenspan Commission projected that it would be fine through 2060? While there are many factors that go into the projections, including not just life spans but also real GDP growth rates, interest rates, real wage growth, and so on, one assumption stands out. Social Security taxes (currently at the rate of 12.4%, for employee and employer combined) only applies to wages up to a certain ceiling. That ceiling is $118,500 in 2016. Since legislation passed in 1972, this ceiling has been indexed in most years (1979 to 1981 were exceptions) to the increase in average wages for all employees covered by Social Security. The Greenspan Commission did not change this. Based on the ceiling in effect in 1982 and again in 1983, wages subject to Social Security tax would have covered 90.0% of all wages in the sectors covered by Social Security. That is, Social Security taxes would have been paid on 90% of all wages in the covered sectors in those years. If wages for the poor, middle, and rich had then changed similarly over time (in terms of their percentage increases), with the relative distribution thus the same, an increase in the ceiling in accordance with changes in the overall average wage index would have kept 90% of wages subject to the Social Security tax. Due to the increase in wage income inequality since the early 1980s, wages paying Social Security taxes fell from 90.0% of total wages in 1982 and again in 1983, to just 82.7% in 2013 (the most recent year with data, see Table 4.B1 in the 2014 Social Security Annual Statistical Supplement). While the trend is clearly downward, note how there were upward movements in 1989/90/91, in 2001/02, and in 2008/09. These coincided with the economic downturns at the start of the Bush I administration, the start of the Bush II administration, and the end of the Bush II administration. During economic downturns in the US, wages of those at the very top of the income distribution (Wall Street financiers, high-end lawyers, and similar) will decline especially sharply relative to where they had been during economic booms, which will result in a higher share of all wages paid in such years falling under the ceiling. Experience turned out to be quite different. Income inequality has risen sharply since Reagan was president. This reduced the share of wages subject to Social Security tax, and undermined the forecasts made by the Greenspan Commission that with the changes introduced, the Social Security Trust Fund would remain adequate until well past 2034. This stabilization of the share of wages subject to Social Security tax at 82.5% is critically important. Should the wage income distribution continue to deteriorate, as it has since the early 1980s, the Social Security Trust Fund will be in even greater difficulty than is now forecast. And it is not clear why one should assume this turnaround should now occur. Finally, it should be noted for completeness that the share of wages subject to tax varied substantially over time in the period prior to 1982. Typically, it was well below 90%. When Social Security began in 1937, the ceiling then set meant that 92% of wages (in covered sectors) were subject to tax (see Table 4.B1 in the 2014 Social Security Annual Statistical Supplement). But the ceiling was set in nominal terms (initially at $3,000), which meant that it fell in real terms over time due to steady, even if low, inflation. Congress responded by periodically adjusting the annual ceiling upward in the 1950s, 1960s, and 1970s, but always simply setting it at a new figure in nominal terms which was then eroded once again by inflation. Only when the new system was established in the 1970s of adjusting the ceiling annually to reflect changes in average nominal wages did the inflation issue get resolved. But this failed to address the problem of changes in the distribution of wages, where an increasing share of wages accruing to the rich in recent decades (since Reagan was president) has led to the fall since 1983 in the share subject to tax. Thus an increasing share of wages has been escaping Social Security taxes. The rest of this blog post will show that this explains why the Social Security Trust Fund is now projected to run out by 2034, and what could be achieved by returning the ceiling to where it would cover 90% of wages, or by lifting it entirely. The chart at the top of this post shows what the consequences would be if the ceiling on wages subject to Social Security taxes had been kept at levels sufficient to cover 90% of total wages (in sectors covered by Social Security), with this either from 1984 going forward, or starting from 2016. While the specific figures for the distant future (the numbers go out to 2090) should not be taken too seriously, the trends are of interest. The figures are calculated from data and projections provided in the 2015 Social Security Trustees Annual Report, with most of the specific data coming from their supplemental single-year tables (and where the share of wages subject to tax used in the Social Security projections are provided in the 2015 Social Security Technical Panel Report). Note that throughout this blog post I am combining the taxes and trust funds for Old-Age Security (OASI, for old age and survivor benefits) and for Disability Insurance (DI). While technically separate funds, these trust funds are often combined for analysis, in part because in the past they have traditionally been able to borrow from each other (although Republicans in Congress are now trying to block this flexibility). The Base Case line (in black) shows the path of the Social Security Trust Fund to GDP ratio based on the most recent intermediate case assumptions of Social Security, as presented in the 2015 Social Security Trustees Annual Report. The ratio recovered from near zero in the early 1980s to reach a high of 18% of GDP in 2009, following the changes in tax and benefit rates enacted by Congress after the Greenspan Commission report. But it then started to decline, and is expected to hit zero in 2034 based on the most recent official projections. After that if would grow increasingly negative if benefits were to continue to be paid out according to the scheduled formulae (and taxes were to continue at the current 12.4% rate), although Social Security does not have the legal authority to continue to pay out full benefits under such circumstances. The projections therefore show what would happen under the stated assumptions, not what would in fact take place. But as noted above, an important assumption made by the Greenspan Commission that in fact did not hold true was that adjustments (based on changes in the average wage) of the ceiling on wages subject to Social Security tax, would leave 90% of wages in covered sectors subject to the tax. This has not happened due to the growth in wage income inequality in the last 35 years. With the rich (and especially the extreme rich) taking in a higher share of wages, the wages below a ceiling that was adjusted according to average wage growth has led to a lower and lower share of overall wages paying the Social Security tax. The rich are seeing a higher share of the high wages they enjoy escaping such taxation. The blue curves in the chart show what the path of the Social Security Trust Fund to GDP ratio would have been (and would be projected going forward, based on the same other assumptions of the base case) had the share of wages subject to Social Security taxes remained at 90% from 1984. The dark blue curve shows what path the Trust Fund would have taken had Social Security benefits remained the same. But since benefits are tied to Social Security taxes paid, the true path will be a bit below (shown as the light blue curve). This takes into account the resulting higher benefits (and income taxes that will be paid on these benefits) that will accrue to those paying the higher Social Security taxes. This was fairly complicated, as one needs to work out the figures year by year for each age cohort, but can be done. It turns out that the two curves end up being quite close to each other, but one did not know this would be the case until the calculations were done. Had the wage income distribution not deteriorated after 1983, and with all else as in the base case path of the Social Security Trustees Report (actual for historical, or as projected going forward), the Trust Fund would have grown to a peak of 26% of GDP in 2012, before starting on a downward path. It would eventually still have turned negative, but only in 2056. Over the long term, the forecast increase in life expectancies (beyond what the Greenspan Commission had assumed) would have meant that further changes beyond what were enacted following the Greenspan Commission report would eventually have become necessary to keep the Trust Fund solvent. But it would have occurred more than two decades beyond what is now forecast. At this point in time, however, we cannot go back in time to 1984 to keep the ceiling sufficient to cover 90% of wages. What we can do now is raise the ceiling today so that, going forward, 90% of wages would be subject to the tax. Based on 2014 wage distribution statistics (available from Social Security), one can calculate that the ceiling in 2014 would have had to been raised from the $117,000 in effect that year, to $185,000 to once again cover 90% of wages (about $187,000 in 2016 prices). The red curves on the chart above show the impact of starting to do this in 2016. The Trust Fund to GDP ratio would still fall, but now reach zero only in 2044, a decade later than currently forecast. Although there would be an extra decade cushion as a result of the reform, there would still be a need for a longer term solution. The financial impact of removing the wage ceiling altogether will be examined below. But before doing this, it is worthwhile to consider whether, if one were designing a fair and efficient tax structure now, would a wage ceiling be included at all? The answer is no. First, it is adds a complication, and hence it is not simple. But more importantly, it is not fair. A general principle for tax systems is that the rich should pay at a rate at least as high as the poor. Indeed, if anything they should pay at a higher rate. Yet Social Security taxes are paid at a flat rate (of 12.4% currently) for wages up to an annual ceiling, and at a zero rate for earnings above that ceiling. While it is true that this wage ceiling has been a feature of the Social Security system since its start, this does not make this right. I do not know the history of the debate and political compromises necessary to get the Social Security Act passed through Congress in 1935, but could well believe that such a ceiling may have been necessary to get congressional approval. Some have argued that it helped to provide the appearance of Social Security being a self-funded (albeit mandatory) social insurance program rather than a government entitlement program. But for whatever the original reason, there has been a ceiling. But the Social Security tax is a tax. It is mandatory, like any other tax. And it should follow the basic principles of taxation. For fairness as well as simplicity, there should be no ceiling. The extremely rich should pay at least at the same rate as the poor. One could go further and argue that the rates should be progressive, with marginal rates rising for those at higher incomes. There are of course many options, and I will not go into them here, but just note that Social Security does introduce a degree of progressivity through how retirement benefits are calculated. The poor receive back in pensions a higher amount in relation to the amounts they have paid in than the rich do. One could play with the specific parameters to make this more or less progressive, but it is a reasonable approach. Thus applying a flat rate of tax to all income levels is not inconsistent with progressivity for the system as a whole. The Trust Fund would now be projected to last until 2090. Again, the projections for the distant future should not be taken too seriously, but they indicate that on present assumptions, eliminating the ceiling on wages subject to tax would basically resolve Trust Fund concerns for the foreseeable future. A downward trend would eventually re-assert itself, due to the steadily growing life expectancies now forecast (see the chart in the text above for the projections from the 2015 Social Security Trustees Annual Report). Eventually there will be a need to pay in at a higher rate of tax if taxes on earnings over a given working life are to support a longer and longer expected retirement period, but this does not dominate until late in the forecast period. The Social Security Trust Fund to GDP ratio would then be safely positive for at least the rest of the century, assuming the different variables are all as now forecast. This would be a surprisingly modest increase in the tax rate from the current 12.4%. If separated into equal employer and employee shares, as is traditionally done, the increase would be from a 6.2% tax paid by each to a 6.5% tax paid by each. Such a separation is economically questionable, however. Most economists would say that, under competitive conditions, the worker will pay the full tax. Whether labor markets can be considered always to be competitive is a big question, but beyond the scope of this blog post. 1) The Social Security Trust Fund is projected to be depleted under current tax and benefit rates by the year 2034. But this is not because retirees are living longer. Increasing life spans have long been expected, and were factored into the estimates (the last time the rates were changed) of what the tax and benefit rates would need to be for the Trust Fund not to run out. Nor is it because of aging baby boomers reaching retirement. This has long been anticipated. 2) Rather, the Social Security Trust Fund is now forecast to run out by the 2030s because of the sharp increase in wage income inequality since the early 1980s, when the Greenspan Commission did its work. The Greenspan Commission assumed that the distribution of wage incomes would remain stable, as it had in the previous decades since World War II. But that turned out not to be the case. 3) If relative inequality had not grown, then raising the ceiling on wages subject to Social Security tax in line with the increase in average wages (a formula adopted in legislation of 1972, and left unchanged following the Greenspan Commission) would have kept 90% of wages subject to Social Security tax, the ratio it covered in 1982 and again in 1983. 4) But wage income inequality has grown sharply since the early 1980s. With the distribution increasingly skewed distribution, favoring the rich, an increasing share of wages is escaping Social Security tax. By 2013, the tax only covered 82.7% of wages, with the rest above the ceiling and hence paying no tax. 5) Had the ceiling remained since 1984 at levels sufficient to cover 90% of wages, and with all other variables and parameters as experienced historically or as now forecast going forward, the Social Security Trust Fund would be forecast to last until 2056. While life expectancies (at age 65) in fact turned out on average to be lower than forecast by the Greenspan Commission until 2010 (which would have led to a higher Trust Fund balance, since less was paid out in retirement than anticipated), life expectancies going forward are now forecast to be higher than what the Greenspan Commission assumed. This will eventually dominate. 6) If the wage ceiling were now adjusted in 2016 to a level sufficient to cover once again 90% of wages ($187,000 in 2016), the Trust Fund would turn negative in 2044, rather than 2034 as forecast if nothing is done. 7) As a matter of equity and following basic taxation principles, there should not be any wage ceiling at all. The rich should pay Social Security tax at least at the same rate as the poor. Under the current system, they pay zero on wage incomes above the ceiling. 8) If the ceiling on wages subject to Social Security tax were eliminated altogether, with all else as in the base case Social Security projections of 2015, the Trust Fund would be expected to last until 2090. 9) If the ceiling on wages subject to Social Security tax were eliminated altogether and the tax rate were raised from the current 12.4% to a new rate of 13.0% starting in 2050, with all else as in the base case Social Security projections of 2015, the Trust Fund would be expected to last to well beyond the current century. Initial claims for unemployment insurance are now at their lowest level, in terms of absolute numbers, in forty years, and the lowest ever when measured relative to employment (although the series goes back only to 1967). 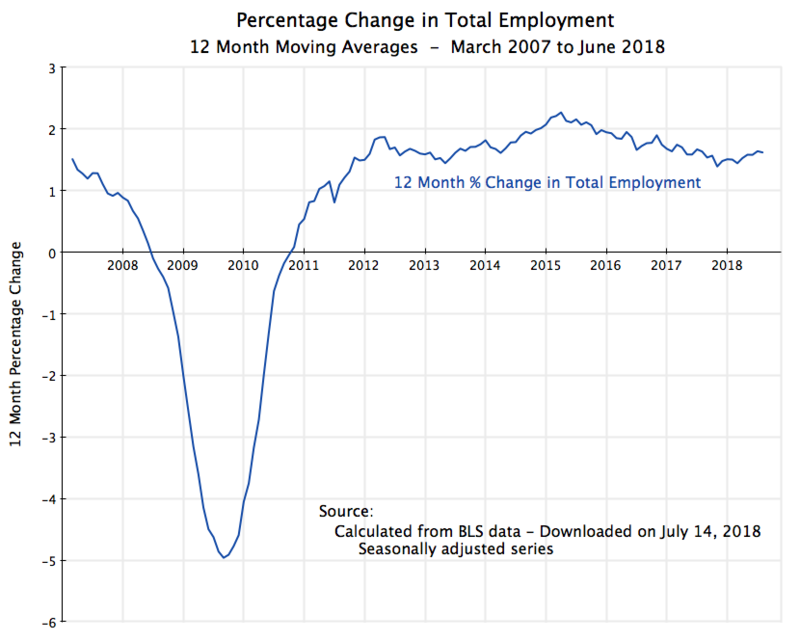 There has been a steady improvement in the job market since soon after Barack Obama took office in January 2009, with (as discussed in a recent post on this blog) a steady increase in private sector jobs and an unemployment rate now at just 5.0%. Yet the general discussion still fails to recognize this. I will discuss some of the possible reasons for this perception later in this post. Initial claims for unemployment insurance provides a good measure of the strength of the labor market, as it shows how many workers have been involuntarily laid off from a job and who are then thus eligible for unemployment insurance. The US Department of Labor reports the figure weekly, where the numbers in the chart above are those updated through the release of November 25, 2015 (with data through November 21). While there is a good deal of noise in the weekly figures due to various special factors (and hence most of the focus is on the four week moving average), it does provide a high frequency “yardstick” of the state of the labor market. The charts above are for the four week moving averages. The measure has been falling steadily (abstracting from the noise) since soon after President Obama took office. News reports have noted that the weekly figures have been below 300,000 for some time now (close to a year). This is a good number. 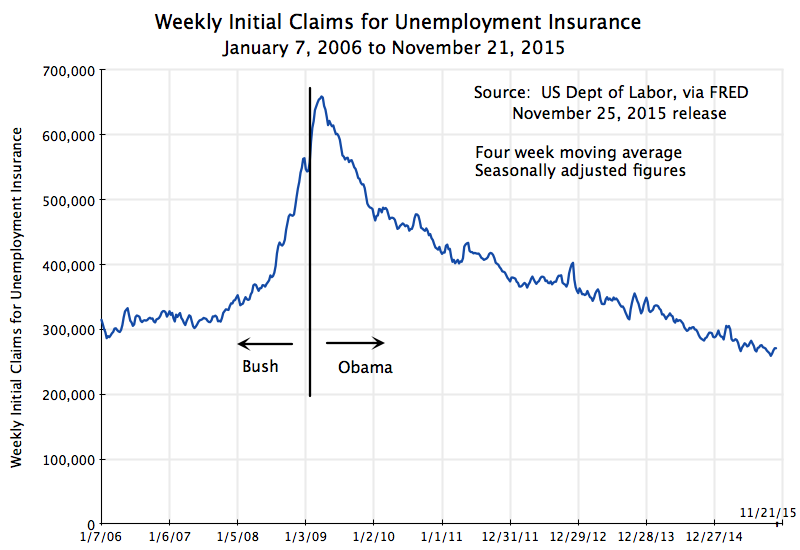 Even in the best year of the Bush administration (2006, at the height of the housing bubble), weekly initial claims for unemployment insurance averaged 312,000. So far in 2015 (through November 21) it has averaged 279,000, and the lowest figure was just 259,250 for the week of October 24. Initial claims for unemployment have not been so low in absolute numbers since December 1973. But the population and labor force have grown over time. 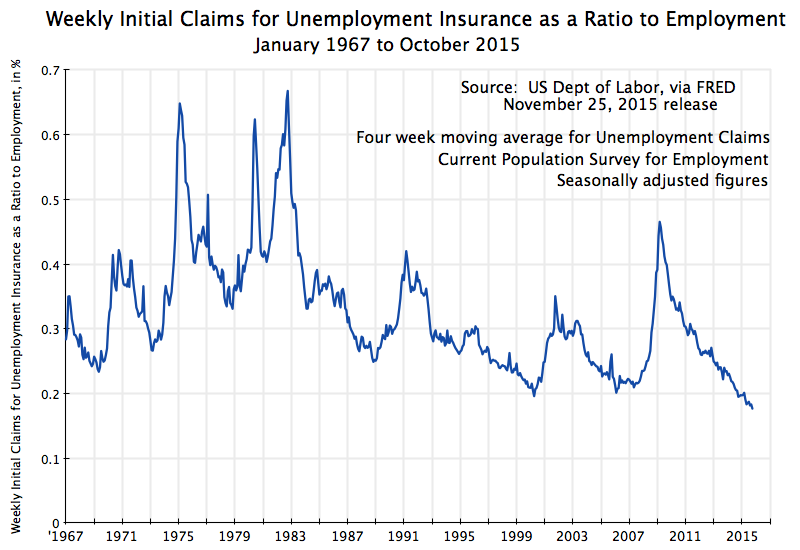 When measured as a ratio to the number of those employed, initial claims for unemployment insurance have never been so low, although the series only begins in January 1967. It is now well below the lowest points ever reached in the George W. Bush administration, in the Reagan administration, and even in the Clinton administration, under which the economy enjoyed the longest period of economic expansion ever recorded in the US (back to at least 1854, when the recession dating of the NBER begins). Why then has the job market been seen by many as being especially weak under Obama? It should not be because of the unemployment rate, which has fallen steadily to 5.0% and is now well below where it was at a similar point during the Reagan administration. Private job creation has also been steady and strong (although government jobs have been cut, for the first time in an economic downturn in at least a half century). There has also been no increase in the share of part time employment, despite assertions from Republican politicians that Obamacare would have led to this. And growth in GDP, while it would have been faster without the fiscal drag of government spending cuts seen 2010, has at least been steady. What has hurt? While no one can say for sure as the issue is some sense of the general perception of the economy, the steady criticism by Republican officials and pundits has probably been a factor. The Obama administration has not been good at answering this. But also important, and substantive, is that wages have remained stagnant. While this stagnation in wages has been underway since about 1980, increased attention is being paid to it now (which is certainly a good thing). In part due to this stagnation, the recovery that we have seen in the economy since the trough in mid-2009 has mostly been for the benefit of the very rich. Professor Emmanuel Saez of UC Berkeley has calculated, based on US tax return data, that the top 1% have captured 58% of US income growth over the period 2009 to 2014. The top 1% have seen their real incomes rise over this period by a total of 27% in real terms, while the bottom 99% have seen income growth over the period of only 4.3%. Furthermore, most of this income growth for the bottom 99% only started in 2013. For the period from 2009 through 2012, the top 1% captured 91% of the growth in national income. The bottom 99% saw their real incomes rise by only 0.8% total over that period. The issue then is not really one of jobs or overall growth. Rather it is primarily a distribution problem. The recovery has not felt like a recovery not because jobs or growth have been poor (although they would have been better without the fiscal drag), but rather because most of the gains of the growth have accrued to the top 1%. It has not felt like a recovery for the other 99%, and for an understandable reason. I started this blog with the domain name of AnEconomicSense.com. The primary domain name is now AnEconomicSense.org, as it better reflects that this is a non-commercial blog. Advertising is not accepted, nor am I paid. Do not be concerned if you see either name: Both map to the same site. © 2011-2019 Frank Lysy. All Rights Reserved.